"Magic" picture created with wax crayon and food coloring. When my children were much smaller and were fretful due to being inside in rainy weather or just needing a little fun, I would do "magic" pictures with them. Take a piece of white paper and using a white wax crayon draw a simple outline picture of anything - a ball, tree, cloud, house, dog etc. 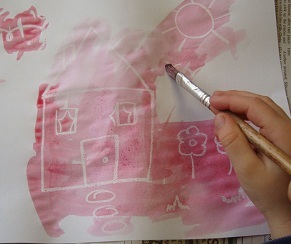 Then let your preschooler color wash over it with water color paint or food coloring in water. Its pouring with rain today, so we tried this activity and my kids won't stop asking me for "Another one please, Mom!" A quick and easy craft! Join in and write your own page! It's easy to do. How? Simply click here to return to Easy Preschool Crafts.